The genesis of this recording is a wonderful story. While I have always loved straight-ahead jazz, with the sounds of swing and bebop comprising the bulk of my listening as a young musician, over the past few years I have felt increasingly, irresistibly drawn to the most significant Brazilian contribution to jazz: Bossa Nova. What started as a gentle nudge - the feeling of ease and happiness while performing a Jobim tune in the middle of a set - soon grew into a powerful attraction, and the desire to spend time with this music and get to know it more intimately was born. Against all odds, I discovered a graduate program in music with a unique Brazilian component to its curriculum only a half an hour from my family's traditional stomping grounds in Oregon. Imagine my excitement when, upon enrolling in this program, I learned that two fantastic Brazilian musicians (Wagner Trindade and Cassio Vianna) would be my classmates and colleagues for the next two years. Better yet, they were two thirds of a trio with extensive professional experience playing jazz and various Brazilian styles in and around Rio de Janeiro. During a year filled with Choro, Bossa Nova, and Samba concerts, I also was honored to become their friend. This friendship led to an invitation to visit Brazil and stay with the Trindade family for nearly a month in the summer of 2010. I also had the opportunity to meet Cláudio Félix, an outstanding drummer who along with Wagner and Cassio formed the aforementioned trio, "Dialeto Brasileiro." 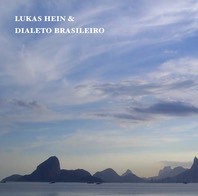 At the end of nearly a month living with the Trindade family and seeing some of the gorgeous sights in Rio de Janeiro, I was able to record this album with Dialeto Brasileiro on my last day in Brazil. In fact, I had my suitcase packed with me in the studio and left straight from the recording session to the airport! While I can't recommend booking time in the recording studio under such a tight deadline, I could not have been more pleased with the results. The rapport in the rhythm section was unbelievable, and we were able to track all eight songs in a little more than five hours. This meant that there was very little editing to do, and for the most part the album consists of complete (and often first) takes. My hope is that this music will reach receptive ears - that is, I hope that it will find its way to those who will be uplifted by it! Creating it was a joy and gift, and there is no higher aspiration for a musician than to share that joy with others.